An Artspace volunteer stopped by to see the group of us living in the gallery, and happened to mention that his dad was conservative. I asked him whether his dad might be willing to talk with me, and he said he would ask. After a couple of days, a few emails and some phone calls we had made a plan for me to meet in Woodbridge, a small town just outside of New Haven where he lived with his wife on her parent’s property. 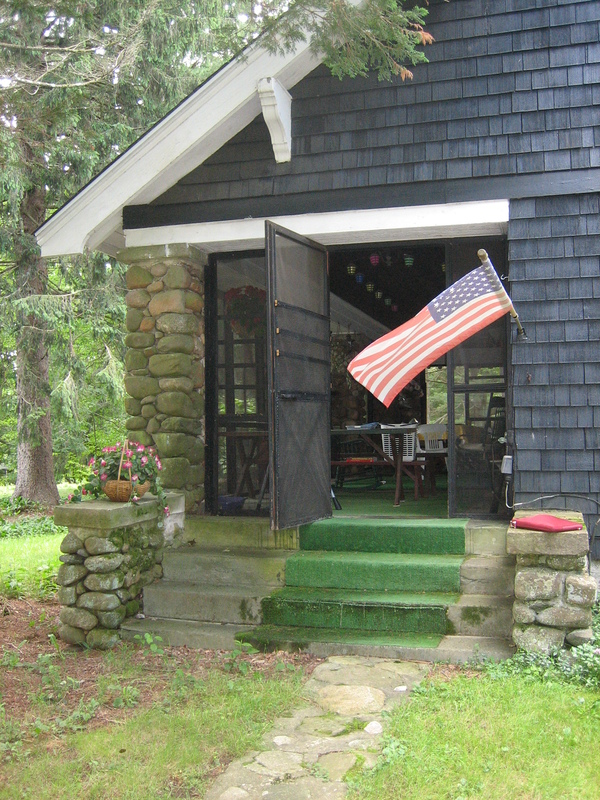 When I arrived he invited me to sit on their spacious covered porch, and offered me soda. I asked him about how he feels about the current state of our Democracy and sipped my drink. He responded that he doesn’t like the term democracy very much, and that “to the best of his understanding the US was meant to be a Representative Republic, and not a democracy.” In my mind Representative Republic has a bad ring because it invokes the discouraging history of our leaders fearing the general American population can’t be trusted to govern themselves, and believing that instead the wealthy should be tasked with governing on our behalf. In response to me expressing my worries about an elite governing class, he said that from his research there was never meant to be a cap on how many representatives made up our government. This would mean that as the population grew there would be more representatives, maintaining a direct relationship between each local population group and their representative, and providing a clear path for the range of American’s interests to be well considered by the government. He contrasted this to an image of Democracy as a tyranny of the majority, ruled by a potentially uniformed and irrational mob, where individuals and minority groups are disregarded because of their lack of voting block. In an attempt to counter this and show how important it is for all citizens to directly advocate for their own interests, I brought up the ugly history of how voting, and therefore full citizenship, used to be limited to land owners. His response surprised me when he said he thought elections should still should function that way. He explained that people without property have nothing to lose when they vote for more taxes from propertied people to fund services for themselves, so they continue to vote for more and more for themselves without consideration of the consequences. I said that I found the idea of basing voting rights on owning land particularly hard to swallow since the cost of buying a home has gone up so much in my life time, and has become simply an impossible dream for many people who work and would want to be home owners. He said that these unattainable prices are in large part because of the increased building regulations that have forced housing costs up. I agreed that we have an awful lot of regulations these days, and that some of them seem ridiculous, but that all those rules are put in place to try to prevent mistakes and swindles that have happened in the past. In his opinion the government trying to solve problems through more and more regulations makes a bad economic environment for business and people. He explained that instead of forcing everyone bear the weight of endless layers of regulation, in a libertarian model of society, if one person built a faulty building they would be made to pay through the legal system – and they would be shamed from persisting in those bad practices through public opinion spread by the media. I noted that this libertarian model of making people pay for the harm they have caused on an individual basis doesn’t have any mechanism for prevention – things have to go wrong and then you can sue for compensation, but you can’t try to put anything in place to avoid people making that kind of mistake again. He told me that historically the church has taken care of disadvantaged people, and not the government. He volunteered that he admits the church has fallen down on this responsibility and in their absence the government has stepped in, but it does a bad job being the caregiver. We started talking about religion and the role of the church in society. He said with calm modesty that when he tries to be as reasonable as possible he thinks intelligent design makes more sense than the idea that the Universe assembled itself through purely random means. This was the first time in my life where I have had a direct conversation with someone across the creationism/evolution divide, and it felt vulnerable and potent. He brought up examples that he saw as evidence of divine design, such as the uniqueness of each person’s finger print, and I brought up examples that I thought showed how no consciousness is needed to create order and beauty, such as the patterns that waves carve into the sandy shore. But he saw my examples as more evidence of God’s presence in the background, and I saw his examples as being equally plausible through complex natural systems. After a while he asked me with dismay what I saw as the purpose of my life, if it is just the result of random processes. I replied that I was comfortable not having any fixed purpose and that I thought it was meaningful enough to try understanding my life as one example of the history of people trying to makes sense of living in relation to other people and the course of human civilization. I appreciated that he was willing to ask me such fundamental question.